At directferries.ie you can plan, compare and book your ferry to Greece sailing to the port of Igoumenitsa quickly, easily and securely online. 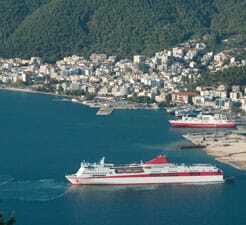 With our ferry comparison tool you can compare all ferries to Igoumenitsa as well as all available alternatives in one quick and easy search. All you need to is pick the departure port for your ferry to Igoumenitsa, select the number of people travelling on this journey and search! The best thing we have found with Minoan Lines over the years is their efficiency and helpfulness over changing return dates. No fuss they just do it . This is real peace of mind.